On Aggression, trans. M. Latzke (1966), 260. I never know whether to be more surprised at Darwin himself for making so much of natural selection, or at his opponents for making so little of it. Selections from His Notebook. Reprinted in Memories and Portraits, Memoirs of Himself and Selections from His Notebook (1924, 2003), 184. In a world created by natural selection, homogeneity means vulnerability. In 'Unmined Riches', The Diversity of Life (1992), 301. In the process of natural selection, then, any device that can insert a higher proportion of certain genes into subsequent generations will come to characterize the species. 'The Morality of the Gene'. ; Sociobiology: The New Synthesis (1975, 1980), 3. 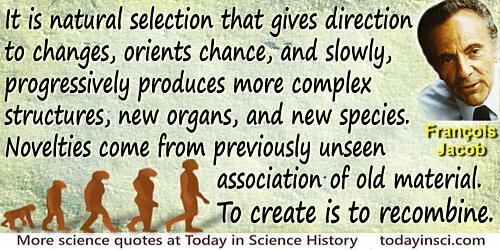 It is reasonable to suppose that if we could apply selection to the human race we could also produce modifications or variations of men. From Paper (13 Nov 1883) presented to the National Academy of Sciences at New Haven, printed in ed in 'Upon the Formation of a Deaf variety of the Human Race', Memoirs of the National Academy of Sciences (1884), 2, 179. This is not a verbatim quote, but it is a summary of Fisher’s idea, as appearing without quotation marks in the words of the editor, Julian Huxley, in J.S. Huxley, A.C. Hardy and E.B. Ford (eds. ), Evolution as a Process (1954), 5. 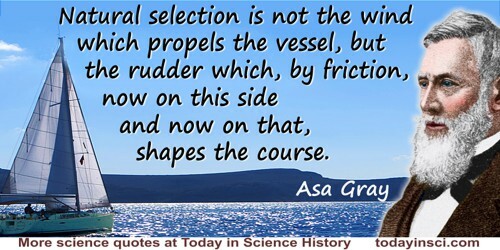 The lengthier quote is from Fisher’s full essay 'Retrospect of the Criticisms of the Theory of Natural Selection' which appears in the same book on p.91. 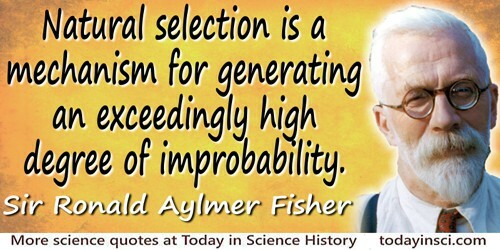 See it elsewhere in this site’s collection, as the Fisher quote that begins: “It was Darwin’s chief contribution…”. Nothing drives progress like the imagination. The idea precedes the deed. The only exceptions are accidents and natural selection. In The Marketing Imagination (1983, 1986), 127. 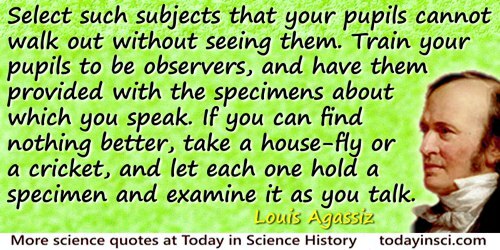 Theories should not be used to select observations; on the contrary, it is observations which should be used to select the theories. From webpage 'The Selection Effect' on laserstars.org website. The article does not specify an author, but the homepage attributes the site to Y.P. Varshni and J. Talbot. Indicating that varicose veins are hereditary. In W. B. Bean, Sir William Osler: Aphorisms, 146. In Mark E. Silverman et al. (eds. 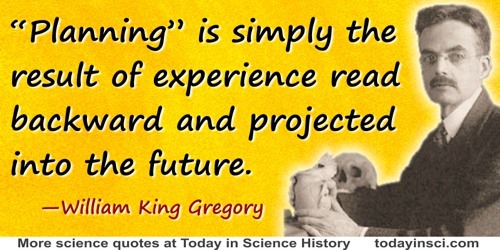 ), The Quotable Osler (2003), 127. 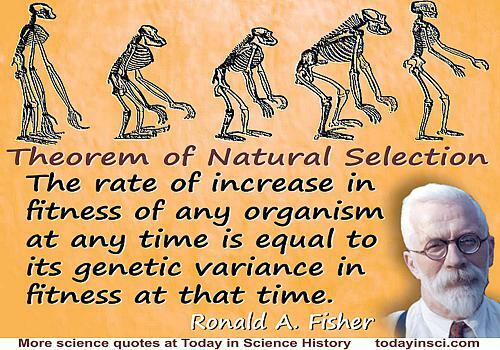 We may consequently state the fundamental theorem of Natural Selection in the form: The rate of increase in fitness of any organism at any time is equal to its genetic variance in fitness at that time. 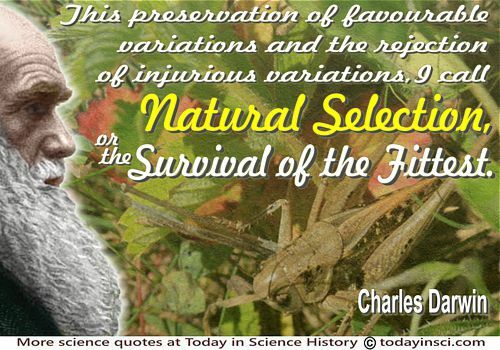 The Genetical Theory of Natural Selection (1930), 35.